The only way for a young Starfleet member to get any respect around a ship like the Enterprise is to have one of those fancy yellow shirts, like all the commanding officers have. Good thing for your child, it doesn't take years of training to get one... he just has to beam one over from HalloweenCostumes.com! This Deluxe Child Spock Costume is just what your child needs to get ready for a continuing mission to "boldly go where no one has gone before." It's a licensed replica of Spock's uniform from the 2009 movie. Whether you want to be head of security on board the U.S.S. Enterprise, like Worf or want to be in command of engineering like La Forge this Star Trek TNG gold costume t-shirt will make the perfect uniform. It's a great starting point for your promising career in Starfleet. Space, the final frontier. If you are ready to join the crew of the U.S.S. 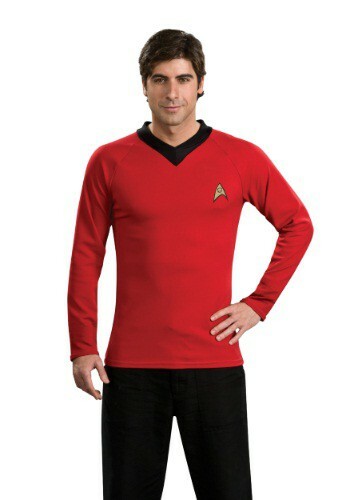 Enterprise then slip on this Star Trek TNG red costume t-shirt and report to the bridge! You're years of watching reruns of Star Trek The Next Generation have prepared you for the challenges of traveling through space. You are bound to encounter many different alien races but fortunately nearly all of them speak English so you're going to manage just fine! James T. Kirk. He's not just the captain of the USS Enterprise. He's a space cowboy, a hunk with the ladies and a crack shot with a phaser, but did you also know that he's also a master in the kitchen? Spock thinks his Apple Brown Betty is the next best thing since logical analysis! This Star Trek Captain Kirk Character Apron lets you channel your inner star captain while your doing some cooking or baking. Just remember to set your phasers to delicious while wearing it! "All she's got isn't good enough!" So little did you know during your rural Iowa upbringings that you would someday be hopping galaxies in a top of the line Federation starship. But you might have never taken that course without this Captain Kirk shirt! Once you have a little bit of his Starfleet style, you're sure to follow in his footsteps. 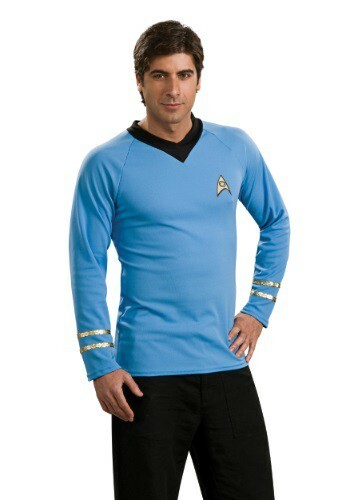 Complete a Star Trek costume look with this shirt and you'll be able to start your journey. But just remember to practice your double fisted hammer punches! "Humans make illogical decisions. "If you feel like lending the Federation a little bit of Vulcan logic, outfit yourself with this Spock shirt. Sure, some of your shipmates will find your demeanor a little off-putting, but we're sure you'll save their butts so many times that they'll be glad you were on the mission. And Kirk? He probably would have gotten lost in space dock if he didn't have his favorite Science Officer to give him a little no-nonsense guidance. Suit up for duty with this Star Trek shirt and you'll feel just like everyone's favorite Vulcan! No matter where you go and what you do, it seems like there's always a Klingon there to mess up your plans. Well, quit griping about it and take some action! 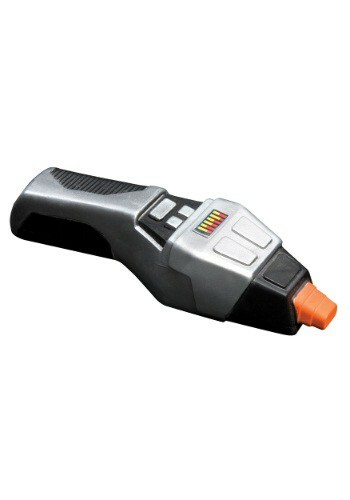 This phaser will be the perfect way to put a wrap on all of your Klingon problems. One look at this accessory, and any Klingon is sure to run back to their Bird of Prey and cook up some blood pie, or whatever comfort food a Klingon eats when they're shook up. 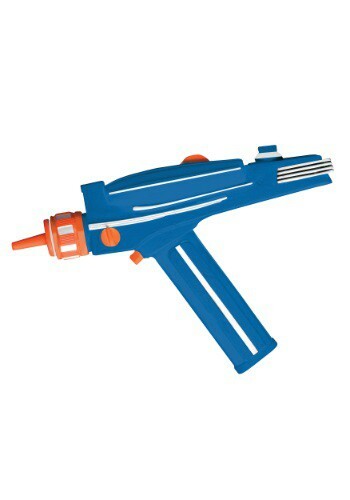 Seriously though, don't even think about suiting up as a Star Trek hero without the goods to back it up... this phaser will definitely complete your costume look! Being commanding officer of Starfleet takes years of dedication, intelligence and courage. Well, that or a yellow shirt. 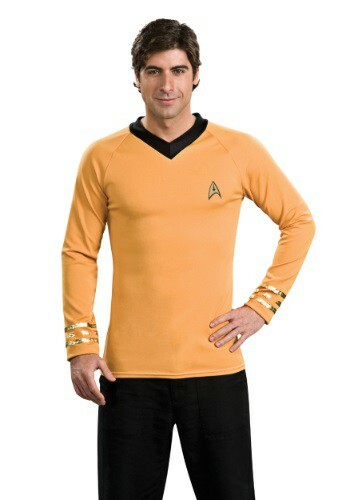 When you slip on this top, the rest of the crew has to respect you, even if you aren't the original Captain Kirk. If you've got a sharp tongue and a mind for quantum engineering, you might just be what captain Kirk needs for his newest mission. 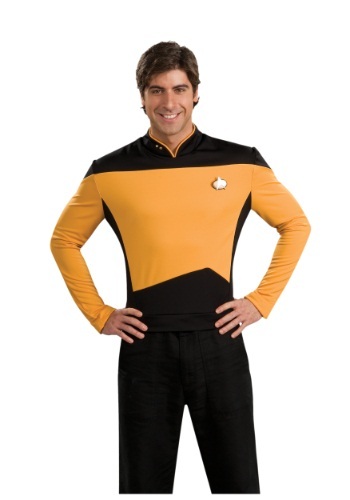 Set your sights on space with this deluxe Scotty costume! You'll have to work on the accent because that's not included, but you'll look so amazing there's no way you won't get a promotion from Starfleet. Everyone knows Spock is the half-Vulcan keeping the crew of the Enterprise from real danger. Without his logical advise, Kirk probably would have gotten the entire crew killed on some half-cocked death mission. Are you the Spock of your crew? You'd better let your group know it with the blue uniform of science personnel. Uhura's not just a skilled xenolinguist, she's also a tough cookie who is ready to take on any villain who's trying to destroy the Enterprise. And that mean's Kirk's going to make sure that she always has a spot on his bridge. 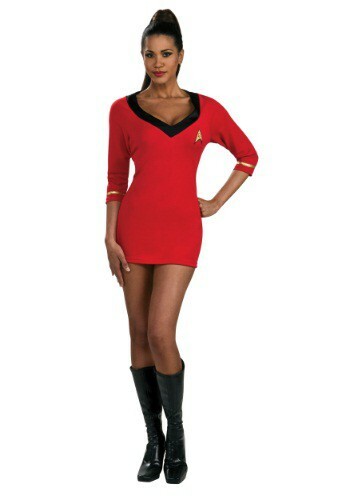 Suit up just like the Uhura from the rebooted Star Trek franchise with this licensed costume. And start practicing your Klingon! What's it like being a communciations officer on the starship Enterprise? Just ask Uhura. Sure, she doesn't get to go on many away missions, but she's ready, willing, and able to help out Captain Kirk whenever she can. He's glad to have a pro like her on his bridge crew, and she's happy to help. You can suit up as the alluring Uhura with this Secret Wishes costume. The Enterprise, nah, ALL of Starfleet will benefit from having you on their side! We know you went to all that trouble to write a Star Trek fan fic, where there's an alternate reality Spock that's a female half-Vulcan, half-Human. Now, you can bring that fiction one step closer to reality with this blue science officer's Starfleet t-shirt for women. Just slip it on and you're well on your way to striking up a romance with Captain Kirk, just as soon as you figure out how to make a working warp drive. Every crew needs a Chief Science Officer. Who else can make the data-driven decision that need to be made in a crisis? This Star Trek Starfleet Blue Skater Dress lets you take on that role! It has the classic blue colors of the science team members from the USS Enterprise. Just don't be surprised if your friends start calling you Ms. Spock when wearing it! You might have thought that it's easy sailing to get posted to a ship like the Enterprise. Nope, not even! You have to finish at the top of your class in Starfleet academy, and even then only the best and brightest get picked by Captain Picard to serve in his crew. The good news? The uniforms are totally dope! This dress us an upgrade to the standard issue uniform and it has all of the comfort and style of a early 21st century skater dress. It's duty approved attire while you're serving on the bridge, but still cute and casual enough to wear for your night out at Ten Forward. 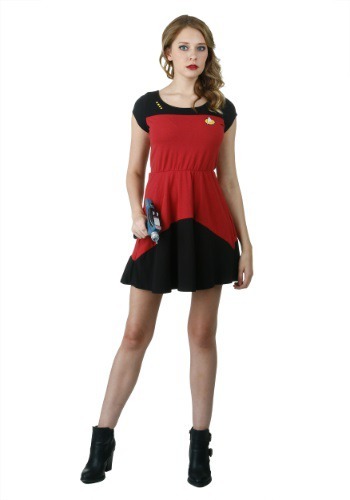 Get this dress for a fun Star Trek costume and it might just become your everyday uniform! You've been assigned to the Starship Enterprise, and you've even been assigned a command position on the bridge! Now the only thing you'll need to do is make sure you have a uniform that fits your style. (Jumpsuits are just not fashionable enough for an up and coming Starfleet officer like yourself!) This Skater dress will be the perfect compromise. It's styled just like a Next Generation standard issue uniform, but with the fun style of a skater dress. It makes a perfect costume for any away mission or for bridge duty. Just pay attention to Captain Picard, because when he says "Engage" he means it! If you're planning an away mission this Halloween, let your newborn join in with this Star Trek onesie! Captain Picard will be really impressed when he see's your little one's skills with a phaser. Suit them up for duty with this Infant Starfleet Uniform onesie and it will be the perfect way to include the whole family in your group theme! Whether you're teamed up with Picard or Riker on this away mission, everyone knows there's only reason they bought you. Because you're a sharpshooter with that phaser on your hip! Even if you're not a full fledged crewmember of the Enterprise, you'll look the part with this accessory at your side. With authentic sound effects, you'll be ready to take on any pesky Romulans or Ferengi who are looking to ruin the Captain's day! We all know that wearing a red uniform was a perilous task when under the command of Captain Kirk on the original Enterprise. But fortunately by the Picard era, the red uniform had moved to to denote a command position, and was a much less risky proposition. 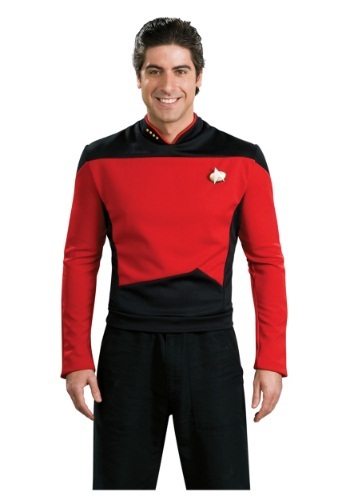 If you've always dreamed of being a Starfleet captain or first officer, this costume will have you ready to beam up! You've done it, as a graduate of Starfleet academy, you've drawn your dream assignment on the starship Enterprise! As a member of the operations team you can work in engineeering or security and be a valued member of Captain Picard's team. Whether you idolize Commanders Worf, Data, or Geordi LaForge your dreams will come true when you work side by side with your heroes to boldly go where no man has gone before! Straight out of Starfleet Academy and what's the first thing you want to do? Party, of course! This little red Starfleet dress is the perfect thing to wear, and who knows, you might just meet Captain Kirk. "Replicator, make me a lime margarita, extra salt!" Have you ever wanted to roam the galaxy seeking out new life and new civilizations? Do you boldly want to go where no woman has gone before? Of course, the answer is yes, but you don't want to do any of that without looking fashionable, right? Perfect, you're in luck, because this standard issue Star Trek yellow dress tunic is all that and more!